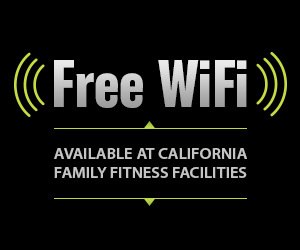 California Family Fitness is happy to provide free wireless internet at 19 locations for your convenience. Enjoy your favorite books, music and content during your workout and don't forget to download our app for tons of features and updates! Just see the front desk for the WiFi password. Please remember to limit talking on your cell phone to the lobby area.